Here is the first photo from "A Series in Red" which is a series of posts about shoes I am making from various inspiration on the web. They are one-of-a-kind and I am not sure that I will make any more than the one pair. I loved the above photo which spoke of summer fun, vintage appeal, gingham, and hues of denim blue and red gingham. Of course, I am a "vintage-loving, spending time on the lake dock" kind of gal anyways. Don't those ladies look like they are just having so much fun together? Lake days are my favorite. The denim in my shoes I created is just the perfect shade of dark denim like my favorite pair of jeans worn cuffed. 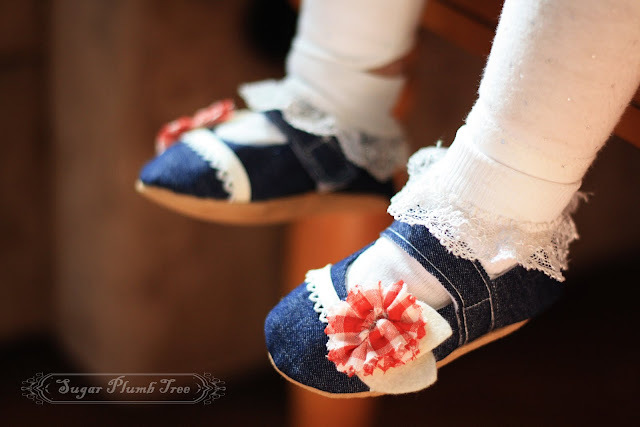 I had some red gingham fabric from the 70's that I made into a little flower and I added a pop of the same fabric to the insole of the shoes. My favorite part of the whole thing though is the vintage binding in white that goes across the toe. This was scored from a vintage stash that also held the red gingham. Isn't it precious? I put them on Tessa briefly for a quick picture so that you can see how cute they really are. They are made in 6 month size (4.25 inches long), but Tessa has really small feet and still wears size 2. Oh! 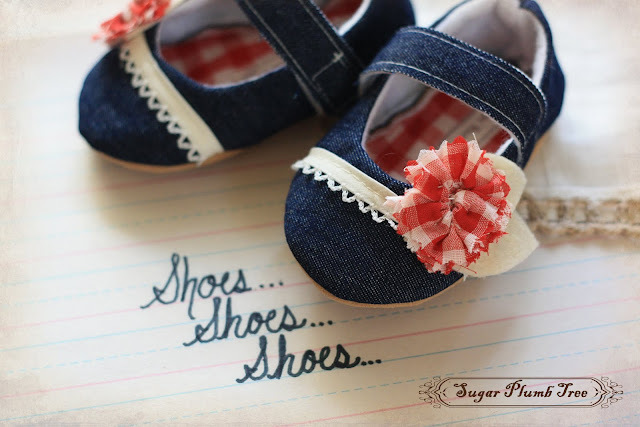 I wish I had a little girl to wear these!!! I need a baby girl asap. Addison would die if I bought these right now.